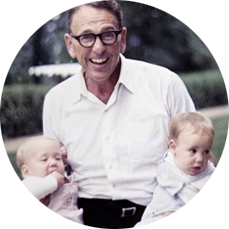 Irving B. Harris was a visionary philanthropist and true leader who was driven by a deep commitment to social justice and equity and inspired by the Jewish tenet Tikkun Olam, “to repair the world”. Irving dedicated much of his life to strategic grantmaking – using his resources and relationships to support the creation and development of programs and preventive practices that benefit infants, young children and their families, that promote social justice, that address inequity, that advocate for human rights, and that strive to enhance quality of life principally through the arts and humanities. Irving was particularly passionate about ensuring that every child was born by parents and to communities ready to nurture that child’s successful growth and development. Irving, through the Irving Harris Foundation, advanced this goal by investing in leadership development and training to strengthen the infant mental health and early learning fields, the development and replication of innovative evidence-based programs to address a particular gap and need in the field, and public policy and advocacy that promoted the realignment of public resources to support high quality, comprehensive services and systems that support the mental health and development of very young children and their families. Irving was driven by a clear understanding that investing early in human capital development would result in significant returns on public and private investments and, therefore, result in the greatest benefit to our society. Inspired by his legacy, the Irving Harris Foundation continues to rely on the same values and strategies to guide our grantmaking. Learn more about Irving and the Tenets in the Zero to Three Journal.